Sewaddle in game: 6,170 Who? Important notice! Pokemon Sewaddle is a fictional character of humans. 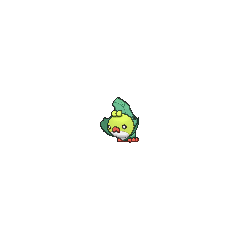 Sewaddle (Japanese: ???? 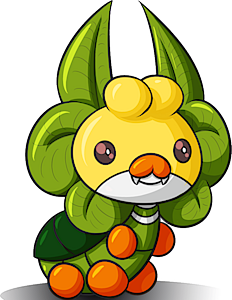 Kurumiru) is a Bug/Grass Pokémon introduced in Generation V.
Ash's Sewaddle made its debut in Sewaddle and Burgh in Pinwheel Forest! where Ash caught it. 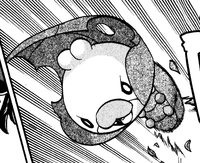 It evolved into a Swadloon in Battling For The Love of Bug-Types! while battling Burgh's Whirlipede, and later evolved into a Leavanny in Battling the Leaf Thieves!. In A Connoisseur's Revenge!, multiple Trainers' Sewaddle were seen at a Poké Mart. In Battling For The Love of Bug-Types!, a Sewaddle was shown to reside at the Castelia Gym. A photo of a Sewaddle appeared in The Four Seasons of Sawsbuck!. 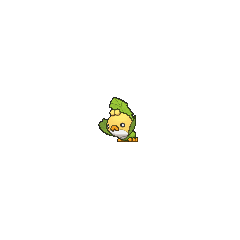 Multiple Sewaddle appeared in A Maractus Musical! 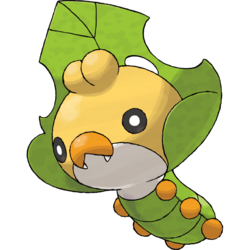 and Sewaddle made brief appearances in Baffling the Bouffalant!, Cilan Takes Flight!, Climbing the Tower of Success!, and Battling the Leaf Thieves!. A Sewaddle appeared in Clash of the Connoisseurs!. A group of Sewaddle also appeared in Genesect and the Legend Awakened at Pokémon Hills. 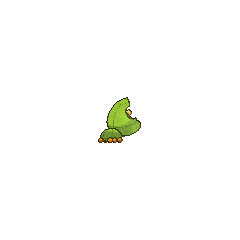 Sewaddle made its debut in Choices, where it attacked Black after he disturbed its nest. Kurumiru may be derived from ?? kurumu (to wrap up) or ?? kurumi (walnut tree). Mandarin Chinese ??? / ??? Chóngbaobao From ? chóng, ?? baobao and ? bao.